The rise and fall of Cadillac and Elvis are surprisingly similar. Both really became popular in America in the mid '50's and went on to be famous lust objects of desire by the mid '60's. But unfortunately, they also shared an ignominious demise. By the mid '70's, both were bloated caricatures of their former selves and come 1977, both of them would be dead. 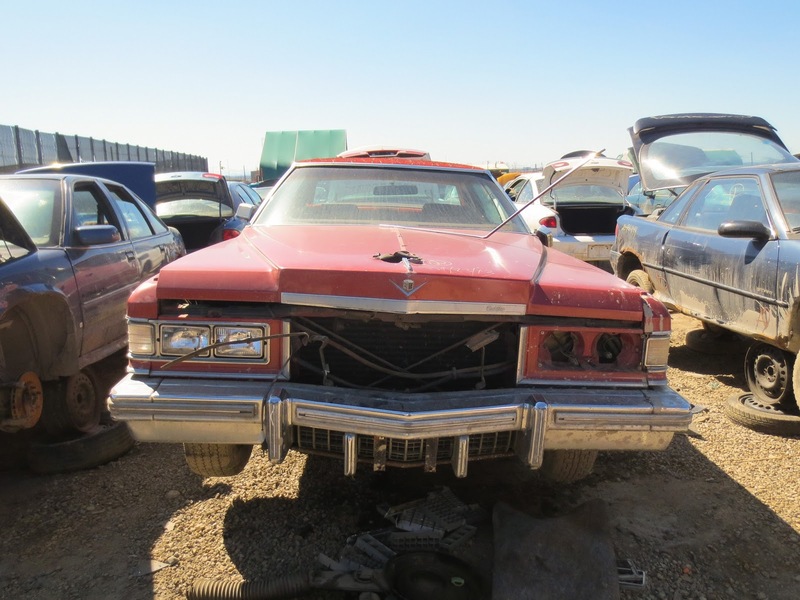 Today's featured 1976 Cadillac Sedan De Ville really sticks out in a modern junkyard. No, actually, take a look at how far it sticks out from the row. The fronts of these cars are all lined up fairly evenly; it's just about 3-4 feet longer than most cars. In fact, it made our lengthy list of long cars a while ago. The Sedan De Ville was never a small car and for 1971 it got even bigger. During the gas shortages of the OPEC crisis, the Sedan De Ville stood as a 19 foot long middle finger to the economic times. 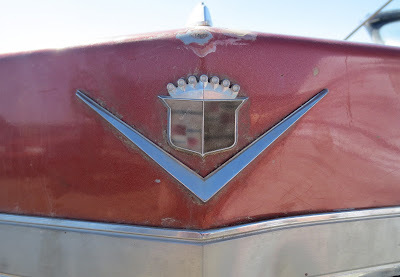 It was a high (or low) watermark for big Cadillacs. Never again would cars grow as large and heavy as those monstrous late '70's barges. 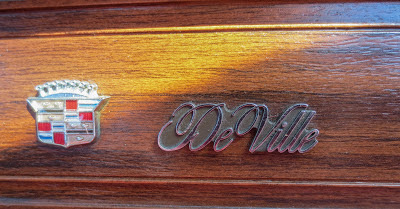 If you got double digit mileage in your De Ville, you were either on the highway or going down a very long hill. The massive 500 cubic inch V8 managed to wheeze out only 210 horsepower. It stands as the largest engine ever offered in a GM production car and sports one of the lowest specific outputs you're likely to find at only 26 horses per liter. 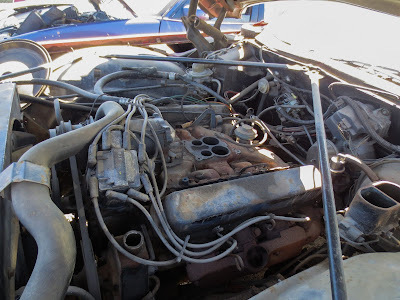 Someone has nabbed the carb off this 8.2 liter fuel disposal unit and now the intake manifold is plainly visible. Naturally, all this excess couldn't last and for 1977, the De Ville was downsized. It was still a massive car, but weighing over a thousand pounds less than its predecessor, it no longer sucked Hondas into its orbit. Nowadays, these gargantuan relics can be bought easily for under $3,000. And nobody bought them but old people so many have been babied and kept well. This car was not so fortunate. 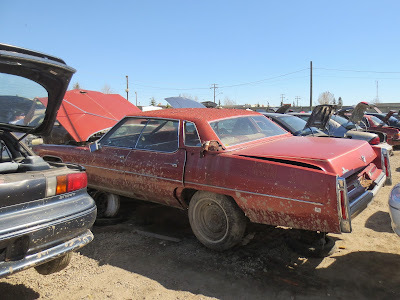 Their monday-after-the-party build quality and 5,000+ pound weight means that these are a constant sight in the junkyard. 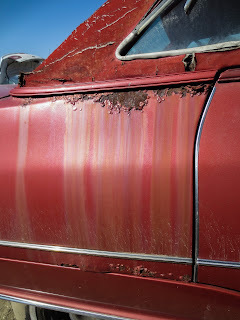 This one's red vinyl top, while oh so bourgeois, contributed to the frightening amount of rust and rot on this car. These tops trap moisture and hold it against the roof rotting it from the inside out. The poor workmanship, dismal fuel mileage and nautical handling are a few sound reasons why buying one of these would be a ridiculous idea. But there's one good reason why you should. These cars have presence. 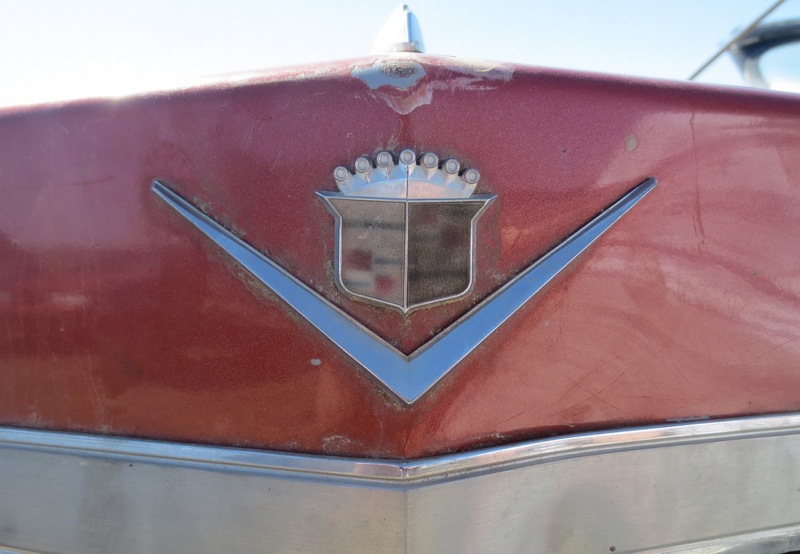 These Cadillacs are finned, razor edged and unapologetic in every way. It's a car that prides itself in its brash nature. For better or worse, there is no car that you can buy today that is as "in your face" as one of these Caddys. 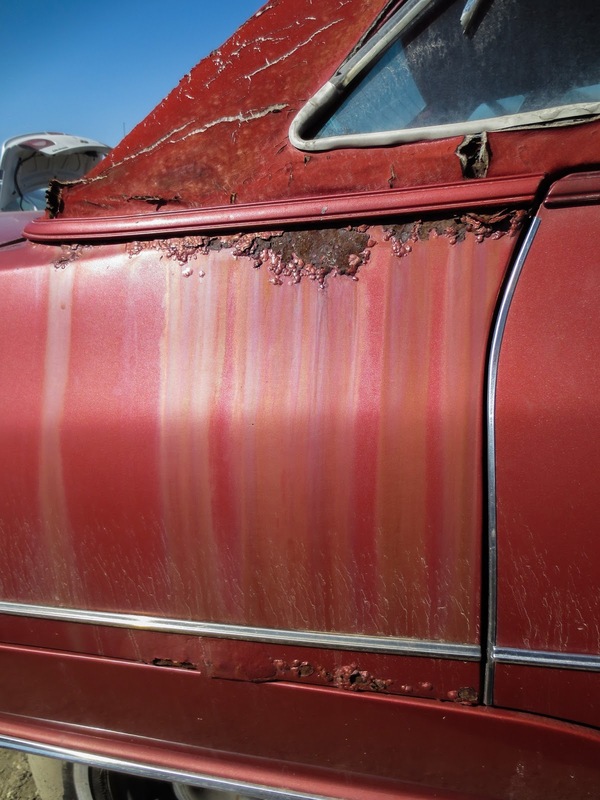 Like Elvis, these cars are a snapshot of Americana, an age that will never come again. Goodbye, big Cadillac, you will be missed.